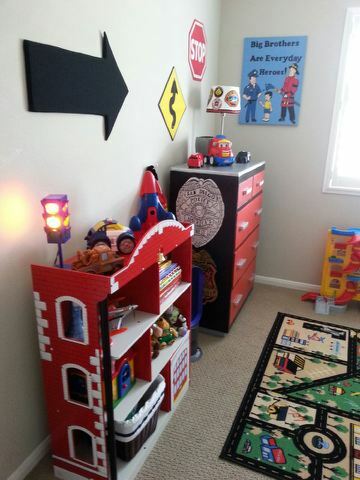 Braden's Room is part of Cecily's Closet's 50th room makeover celebration! 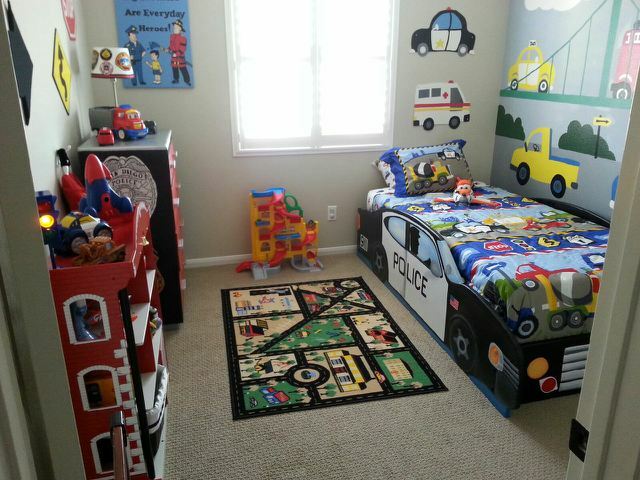 When nurses Joanne and Jeremy became pregnant with their second child, they knew they needed to get a bigger home. In the process of buying their home and feathering their nest, their eldest son, Braden, was diagnosed with a mild form of Autism. When Riley was born in November 2013, his diagnosis of neuroblastoma set their plans into a tailspin. An extended hospital stay for Riley ran the family agenda for a while; so they never really had time to focus on the new nursery and playroom. Friends and fellow nurses rallied around the couple as they attended to the needs of both boys, and the NICU nurses at Rady Children’s Hospital recommended the family for a Cecily’s Closet room makeover. Enter Cecily’s Closet Project Lead and amazing artist, Emily Dolton. Emily knows a thing or two about balancing the needs of a healthy older toddler while tending to a sick baby in the NICU. As a mom of a child with special needs, Emily has lived in this family's shoes. 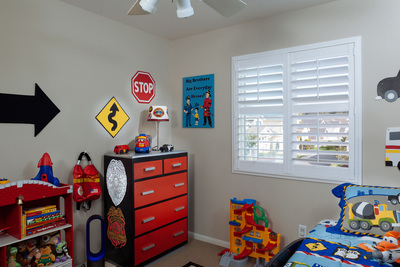 Her heart broke for the family and she jumped in feet first, rolled up her sleeves and worked her fingers to the bone to provide this devoted family with a sanctuary for not just Braden, but Riley and a shared playroom space for the family, too. Emily worked with the family and balanced their tough schedule of caring for two children with significant developmental and medical needs. Braden is a BIG fan of first responder vehicles, perhaps due in no small part to his parents being accomplished nurses and heroes to the many families who rely on their care. Emily enlisted the help of Commander Teresa Miller of Balboa Naval Medical Hospital and Lt. Doug Miller of the San Marcos University Police Department to help build a police car bed from Emily’s sketches. Doug knocked it out of the park and was there in uniform to lead Braden in and egg hunt the day of the reveal. 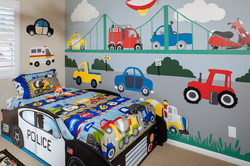 Emily drew upon the bedding images to create a vehicle mural which Braden loves. Madison and Kearney High School friends helped assemble and paint furniture for Braden’s room, making it a full community project! Former Policeman Donald Hunter and Firefighters Mike Wells of the Plumas National Forest Crew and Brady Holden of SD provided patches for our first responder lampshade. Brady also brought in a fire truck on reveal day and Braden and the neighborhood kids took turns watering the lawn with their firehouse! Sharla Hank from Down Syndrome Action was able to secure Chopper the Biker Dog for an appearance as well! Bubble play and silliness ensued while visitors checked out the rooms and professional photographer, Andy McRory photographed the day! We would like to additionally thank PaintGreen, Sandra Bishop and Diane Niles of the SDRC, Missy and Tori Johnson of Rhapsody in Bloom, Amy McDaniel, Roxanne Constandse, Ranie Hunter, Robert Liwanag and Will Cotter for their friendship and contributions. Special heartfelt thanks to Nurse Julie and her husband who made the reveal day happen and to Commander Teresa Miller for arranging food and baking cookies for our guests! Wow! What a TEAM! 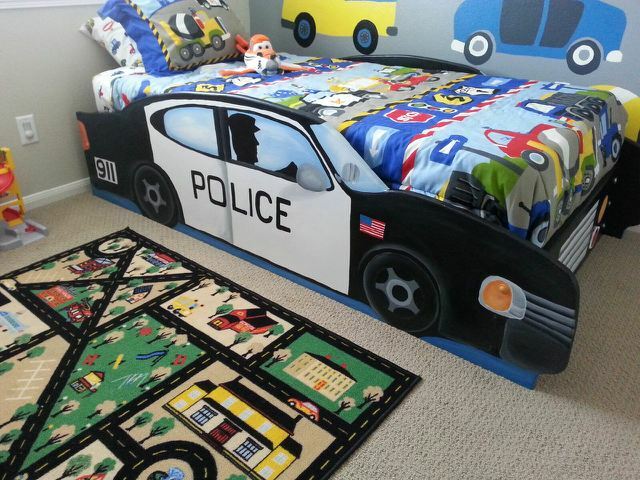 Thank you for making Braden's Sweet Dream Room Makeover possible!